Sorry for the lag in posts over the past couple of weeks. This one was close, but not quite ready before I took off for some Christmas time travels. This is something I’ve been thinking about for a bit and have recently begun to look into further. I suspect it will be a reoccurring topic with the blog. I started thinking about this after trying a couple of 100% Brettanomyces (commonly shortened to brett) beers that I thought were flabby and pretty awful in the mouthfeel department. Something wasn’t quite right. That contrasts with highly-attenuated saisons that I regularly have finish at/around 1.000 but that don't seem too thin and this got me thinking about what was up with these brett beers. I soon discovered that this was potentially due to glycerol production by the yeast, and I suspect many out there have come across this info as well. So I want to get in to thinking about body/mouthfeel in sour beers/brett beer/general beers with very high levels of attenuation. I am treating this post sort of as a jumping board for organizing thoughts and going further into this. And it can also serve as a quick primer if you are wondering what glycerol is, how it gets into your beer and why that matters. Glycerol is a compound produced by yeast during fermentation. For the microbiology minded out there, glycerol production helps yeast correct an NAD+/NADH imbalance caused by fermentation by acting to restore the depleted cellular NAD+ levels. It is the act of producing the glycerol, and not having glycerol around in the environment, which corrects the imbalance. For the non-microbiology minded, producing glycerol helps yeast cope with the stresses of living in an alcoholic environment. For the beer (or wine) drinker, this glycerol adds mouthfeel to the beer. It turns out that brett doesn’t produce glycerol (potentially in certain strains/in some cases brett can produce glycerol but in MUCH lower levels than normal Saccharomyces yeast). The table at right shows average glycerol levels in acid beer (6 Belgian and 1 German), lagers (8 Dutch, 2 Danish and 1 German) and ales (2 Belgian, 1 Dutch and 1 German). The error bars for the darker columns represent standard deviation and the error bars represent the spread of the data (top of error bar = max value, bottom or error bar = min value) in the paler columns. As you can see, ales are generally showing slightly higher levels, but also with much larger variability within this specific sample set. Meanwhile acid (sour) beers generally show lower levels, which makes sense given the importance of Brettanomyces yeasts in the fermentations of some sour beers. 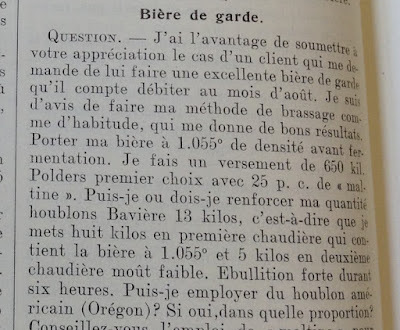 What was surprising to me about this data is that the glycerol production is in the range of grams/l meaning beer is 0.1-0.3% glycerol by weight. That's only about an order of magnitude less than the amount of alcohol produced! So glycerol is a reasonably major byproduct of fermentation. Constructing recipes with mouthfeel in mind: When talking about body in beer in this podcast (this episode of Brew Strong ~13 minutes in), Charlie Bamforth (brewing professor at UC Davis) said that it takes a considerable amount of dextrins to achieve much of a mouthfeel impact. And he mentions he has heard others suggest that glycerol makes a bigger contributor to mouthfeel. So mashing at higher temperatures for more body may not be the most direct/best way to get a beer with a more full mouthfeel. This is especially true when dealing with brett. Brettanomyces yeast strains have extracellular and intracellular a-glucosidase enzymes. This means that brett is able to break down and ferment the dextrins that normal brewing yeast can’t and is a reason why brett can achieve such high attenuation levels. So mashing high in a brett beer doesn’t necessarily mean you end up with more dextrins in the final beer. But it certainly could mean that you are in for a LONG fermentation as the brett slowly chews away at all those dextrins you carefully created in the mash. So here you basically have a lose-lose: the dextrins you made may not survive and you have and an unnecessarily extended fermentation. Chad Yakobson of Crooked Stave, one of the foremost experts in brett fermentation, suggests another route: building body by using grains with higher protein levels. These will remain through to the finished beer, unlike dextrins from a high mash temperature, and can fill the void left by using low glycerol producing yeasts like brett. Chad uses oats and spelt (5-8% of the total grist) and suggests other grains such as rye. Closing Acknowledgement: Although I mentioned it above, I should note again that a lot of the information here (and a bunch in posts to come) comes from Chad Yakobson. Specifically his presentation at the 2011 NHC and this podcast. P.S. The data from the glycerol plot is from Klopper et al., 1986. That is interesting about the lager yeast producing less glycerol. I guess that contributes somewhat, if not a lot to the crispness of lagers. Good connection on the lager crispness. It will be cool to see what that sour turns out like Tim (and also funny about the no adjuncts and perhaps forgotten reasoning). I don't know how wine yeasts compare with respect to glycerol, but I imagine that info is out there somewhere. From the description of that yeast and the ability of Brett to reprocess/change around esters that could create some cool stuff. I look forward to seeing how that turns out. I've got a somewhat similar project going: a dark strong sour with http://www.lalvinyeast.com/RC212.asp as the main 'clean' yeast along with a bit ECY02 and other miscellaneous bugs. There's a lot in that beer but also no grains other than malted barley. But it's much younger and a ways off from bottling time. I believe that wine yeast tends to produce a considerable amount of glycerol. Wine lacks dextrins, arabinoxylans etc. so to get body it depends on glycerol and tannins. If not barrel aged, probably nearly completely on glycerol.